Skoda mildly updates its third-gen Fabia supermini with fresh looks and additional tech. Skoda's mid-sized SUV is, as is typical of this company, a little beauty of a machine. An off-road-specific version of a large 4x4 vehicle? How does that work, then? Here be a dragon as Skoda unleashes the racy-looking Superb 280 TSI Sportline. 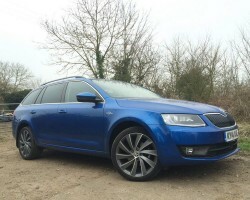 Adam Towler lived with a Skoda Octavia Estate for a few months. How did he get on with the L&K specification model?